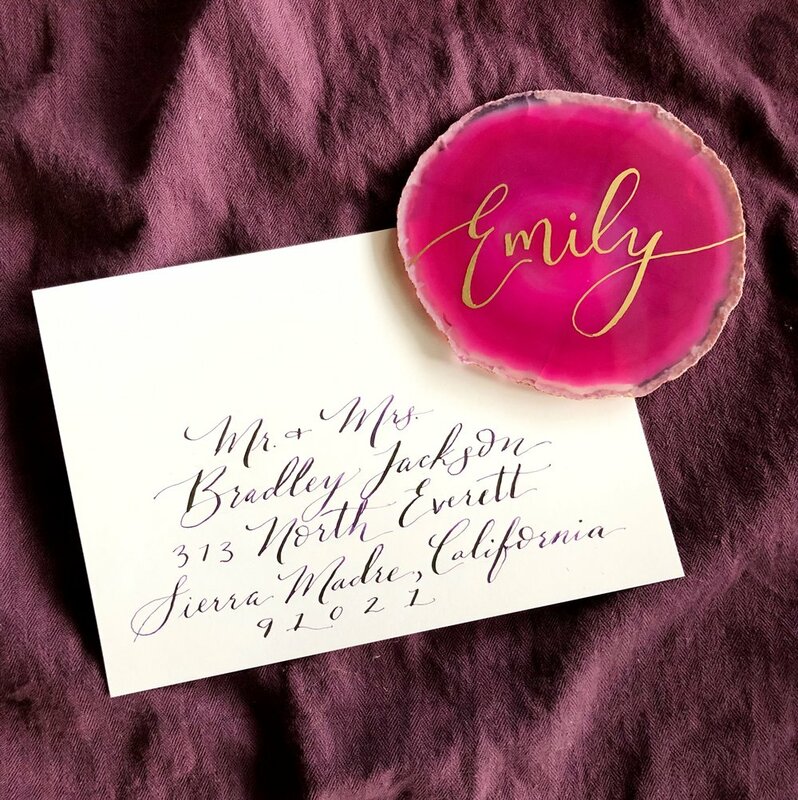 I often get asked what the process is like for envelope calligraphy since most people have never worked with a calligrapher before - so that is what I am going to share with you today! In order to book your spot in my calendar for envelope calligraphy, you'll first have to reach out to me with a few details. My calligraphy and hand lettering work is completely customized to fit your needs, and I therefore ask you to follow a certain process for reserving time in my schedule. When getting touch with me about envelope calligraphy and other calligraphy services, I ask that you fill out this questionnaire. After you fill out the questionnaire, I will reach back out to you via e-mail with any other questions I may have. Once I have all the details I need, I will provide you with my availability, a custom quote, and 3 suggestions for calligraphy styles based on the style of your event. If you have a style of calligraphy you love, feel free to send it to me as inspiration. Once you approve the custom quote and selected your calligraphy style, we will both take a look at our schedules and set a start date. Once we have set an agreed start date, I will send you your 50% non-refundable retainer invoice and letter of agreement. The 50% retainer will be due before any calligraphy work can begin. The remaining 50% + any additional fees incurred will be invoiced once your envelopes are completed, and will be due before I can deliver the envelopes back to you. Once you have signed the letter of agreement and paid the 50% retainer invoice, I will have you ship your envelopes to me. If you don't already have envelopes, I would be happy to order envelopes for you at cost. I do ask that you provide 15-20% extra envelopes to account for ink splatters and/or human error. If you are local to the Rochester, Minnesota area, we can meet in person to exchange the items, letter of agreement and payment (if you prefer to pay by check). I will also need a digital typed copy of your guest list, in either a Word or Excel document (it will not be accepted in any other format). I am happy to provide templates for you, and a free addressing etiquette guide is available below. The document you send me will need to be completely spelling and grammar-error free, as I cannot be held liable for any errors in the document you provide to me. Once your envelopes are completed, I will send you over your final invoice and an email letting you know so that we can arrange a time to ship them back to you. If you are local to the Rochester, Minnesota area or live less than an hour away, I am happy to meet up to exchange them in person. The final invoice will need to be paid before I can hand over the envelopes. Calligraphy holds a truly special place in my heart, and is something I absolutely love offering to my clients. 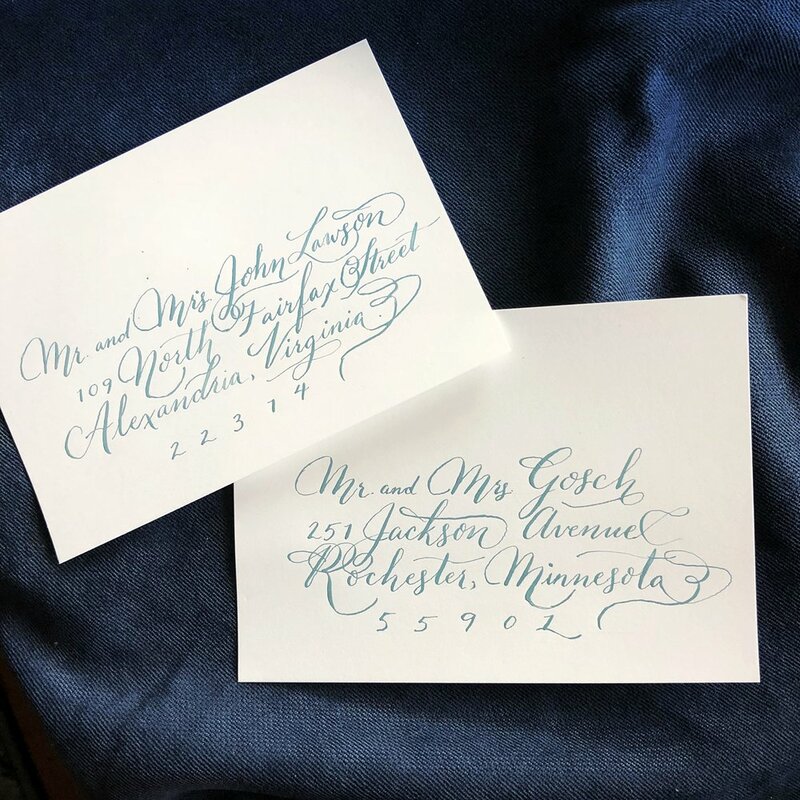 If you are interested in calligraphy for your wedding invitation envelopes or special event, I'd love to chat! Download my FREE Envelope Addressing Etiquette Guide to help you get your envelope wording just right! Sign up with your email to receive the Addressing Etiquette Guide. Older PostHaley's Condo Reveal with Before and Afters!